It's small, compact, customizable, easy to deploy and free to use! Example page optimized for the mobile devices with the menu is here. 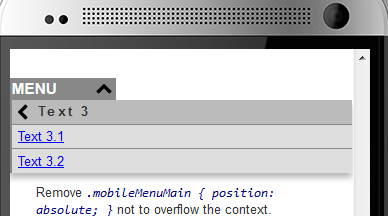 Dowload the Menu jQuery Plugin (compressed) or the this whole example. As showed in the example data above, the structure starts with the menu record with a value of a list of menu items. Every menu item has a name and a link or a sub-menu of the same structure recursively. The menu component contains several CSS classes which can be styled by the user. The easiest way is to download the example CSS style sheet and adjust it. The starter element will get this class additionaly. Together with the class expanded indicates the opened menu. The wrapper for the whole menu context. It's important to set atributte position:absolute for this to make the menu overflowing the context of the page below. The container for the menu items context. The menu item showing the name of the currently expanded class. The first item in the first menu list (without title item). Indicates that the menu item has no sub-menu but it's only a simple link.